Little League baseball rules are updated and published every year in what is referred to as the "Green Book". Little League keeps a strong hold on thier rule books and do not distribute them freely to participants. Each team is issued 2 rule books at the start of the season (one for TBall and Coach Pitch) and CRLL does provide new umpires with a new rule book when they complete thier intial training. 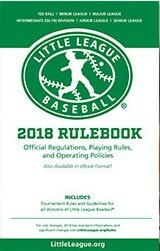 Hard copies of the rule book are available for purchase from the Little League International website for $7.00 US and digital e-copies are available for $4.99 US. For parents interested in purchasing a rule book please contact Pres Carleton Russell as CRLL my be able to order copies at a reduced cost. CRLL house rules are available for parents and coaches. These rules are periodically updated. It is expected that an updated version will be available prior to the start of the 2019 Spring Season. These rules are generally applicable to all CRLL divisions noting however that there specific rules governing the Ottawa Interlock League for our Junior an and Senior divisons. 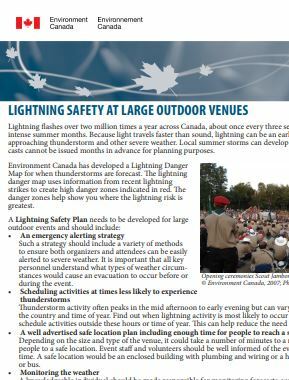 CRLL Lightning Safety Policy - CRLL follows Little League and Government of Canada Guidelines, essentially - if either thunder is heard or lightning is seen, the game will be suspended and the 30 minute delay process will begin. See below for more information. Dependent upon the number of teams across Ottawa at the Junior and Senior Divisions, our CRLL teams will play in an interlock league with either our District 6 sister leagues or in some situations with a larger interlock of leagues around the greater Ottawa area (Districts 6 along with 2,7, and 8). Although the Interlock rules for both situations are similiar there are subtle differences that coaches and players should be aware of. 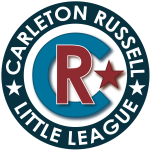 CRLL follows Little League and Government of Canada Guidelines as endorsed by D2 and D6 Leagues, essentially - if either thunder is heard or lightning is seen, the game will be suspended and the 30 minute delay process will begin. Coaches and umpires need to be aware of the following guidance. 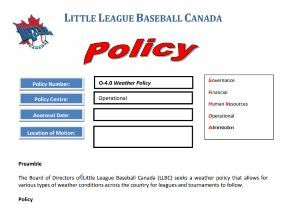 LL weather policy that provides guidance on various eeather conditions across the country for leagues and tournaments to follow..
CRLL does not have an official policy in place for cancelling games because of heat, we rely upon the coaches and umpires to use thier judgement in assessing the conditions of the day. As always our coaches and umpires remain responsible for safety and as such they have the authority to cancel games in extreme heat conditions. Ultimately the player's health is our priority. Parents play a very important role - if parents feel that it is too dangerous for their child to play due to heat conditions then they should inform the coach and not bring the player to the game. It is strongly recommend that plenty of water be brought for all games and especially those played in extreme heat conditions. It is also recommend that timely water breaks are taken and the umpire be asked before the game to allow this as well as frequent substitutions made so players don't get overheated and exhausted. The time between innings can be increased to allow players to rest, cool down and intake water. Make sure your children and players have sun block on. Remember, the summer will bring hot conditions so please protect yourself and most importantly, your children, from the heat and sun when outside. If one of your players begins to develop cramps, dizziness, or other signs of heat stress, they should be removed from the game, given cool water, and placed in as cool a place as possible - such as in a car with air-conditioning or in a cool, shaded area.